What are the City's priorities? 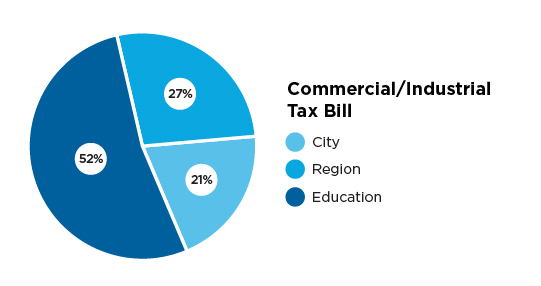 Where does the City get money from? What are the challenges facing the City? Find out more. Delivering the right services– we try to understand citizens’ expectations and priorities and improve our service where possible. Implementing cost containment strategies - we review the cost of current services; try to be more efficient in delivering services and look for better, more innovative ways of delivering services. Maintaining our infrastructure – we look at all our roads, bridges, buildings, parks and other infrastructure and assess their current state; we set priorities for repair; plan for each type of infrastructure and address growth concerns. Advancing on our strategic vision – we continue to implement our Strategic Plan; adopt best practices; and ensure Mississauga is a place where people choose to be; a global urban city recognized for its municipal leadership. In the past, the City has funded much of its infrastructure projects through charges that developers paid to the City to build new homes and businesses in Mississauga. Now, with the City largely built, most development projects are smaller in scale, and the revenue received from development charges is much lower. Ontario’s Development Charges Act limits the types of infrastructure costs development charges can fund. When infrastructure starts to deteriorate, municipalities must fund, repair and maintain it through property taxes or find other sources of funding. Read the Development Charges Act. Find out more about development charges in Mississauga. More information about Mississauga's Reserve & Reserve Funds. The City of Mississauga is one of four levels of government with various responsibilities: Municipal, Regional, Provincial and Federal. 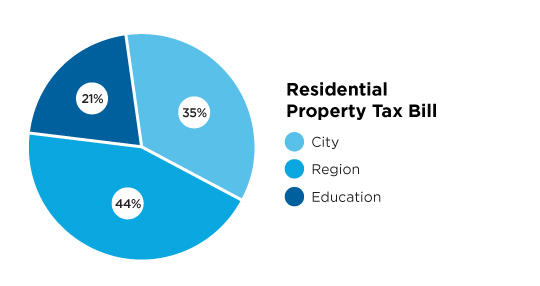 The property tax bill in Mississauga provides funding for services provided by three levels of government – The City of Mississauga, the Region of Peel and the Province of Ontario for the Ministry of Education. Mississauga is part of a two-tier government structure. This means Mississauga’s property tax bill provides funding for local city services and regional-level services, as well as for education. Visit the Region of Peel’s 2019 Budget for more information. To maintain services citizens expect while keeping infrastructure in a good state of repair, the City must increase taxes. Growth in GTA communities is creating more traffic on roads which leads to increasing need for transit options. Transit ridership demands are growing faster than population growth and additional services will bring additional costs. Since the City is mostly built, large scale residential and commercial construction is slowing down, reducing development permit revenues. The energy market is unpredictable. The Emerald Ash Borer, an invasive insect, is threatening to destroy the City’s tree canopy and requires a special levy to deal with this problem. The City’s aging infrastructure needs repair and ongoing maintenance. The development of the downtown and the waterfront are still in the planning stages. These plans will require an investment of public funds. Climate change and recent weather events highlight pressures with storm water management. A stormwater charge was approved for 2016. To learn more, download the complete Business Plan and Budget or the Executive Summary.